semimanufactures, crude materials, and manufactured foodstuffs. cent higher than the December 1963 total of $2,186.2 million. atr-it- on the December export activity. verify these items in time to include them with the lDecember 1964 data. to $920.0 million in 1963.
fats, from $9.7 t.: ti-. rill;-..,. crease in exports of corn, from $76.3 to $61.0 million. and diplomatic missions abroad for their own use are excluded from export statistics. statement, see foreword in Foreign Commerce and Navigation of the United States. For sale by the Bureau of the Census, Washington, D.C. 20233. Price 10* per copy. Annual subscription (FT 900, 930, 950, 970, 975. 985, and 986 combined) $5.00. T tal ...... ................................. value . Hides and skins, raw, except furs.................... value.. Animal and fish oils and greases, inedible........1,000 lb..
All other crude materials............................ value.. Vegetables, fresh or dried........................1,000 lb.. Fruits, fresh or frozen...........................1,000 lb..
All other crude foodstuffs........................... value..
Meat and meat products............................1,000 lb.. Fish, canned, prepared, etc.......................1,000 lb.. Fruits, dried and evaporated......................1,000 lb..
.'-'v 1: oils, fats and waxes, refined...........1,000 lb..
. -ar and related products...........................value..
by individuals and private agencies.................value..
All other manufactured foodstuffs.................... value..
Ar. : t. ic C.. ......................... ...................... value.. .3 -.3 4." -naaL arri:,, maLr.:iino. gj.na,, part: and accessories, n.e.c........'.alie.. 1. ..1 4. S'6 million of Military Assistance Program.-Grant-Aid shipments I S26.0. 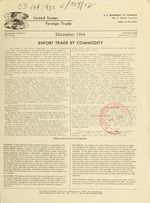 million to Western Europel See the January 1961 issue of Report No. FT 410 for explanation of Special Category commodities and list of commodities included.